THE REVIEW: After Skyfall the consensus was that Bond is back. Many thought, myself included, that Skyfall was one of the best films in the franchise and it was a welcome sight after the overwhelming disappointment that Quantum of Solace was. With Sam Mendes back at the helm, Daniel Craig playing the title role, and speculation abound as to who exactly Christoph Waltz’s character is, hopes were high that Spectre would continue the path started in Skyfall. While I came away enthralled, Spectre also had many questionable moments which, the more I’m thinking about it after-the-fact, the more I feel like a second-viewing will leave me underwhelmed. Before the first image lights up the screen, we are presented with opening text that reads “The dead are alive”. I’m sure many people could pick this phrase apart and analyze it to death (haha), but the takeaway it left me with was that Spectre wakes up some skeletons that were best left in the cellar of Bond films past. Daniel Craig’s bond has, without a doubt, been drastically different from previous Bonds. He is still the same character — professional assassin, spy, etc. — with a love for alcohol, women, and danger, but Craig’s Bond brought a humanity and realism to the character. He was one of us; mortal and capable of error. You still know he’ll end up surviving at the end of the film, because Bond must live, but what he experiences and what he’s put through in the interim changes who he is. He cares for some of the women he sleeps with and is conflicted about killing some of the targets. For better or worse, this is the Bond that Craig created. One of my biggest problems with Spectre is that this character is missing for large parts of the film. The opening sequence in Mexico City during the Day of the Dead festival — which is one of the only areas many critics seem to universally love — didn’t serve as a great introduction. Not only was I not enamored with the action in this scene particularly, but James Bond saunters about without a care in the world in a way you never even saw with past Bonds. Yes, the character should be suave and have a certain swagger to him, but it was too over-the-top — with respect to Craig’s Bond and other Bonds. Also of note is the portrayal of women in Spectre. The films have never done well in this area before with most Bond girls serving as the damsel in distress, waiting to be saved, and eye candy for the audience and Bond to ogle at. If the status quo was kept it still wouldn’t be acceptable, but it would be understandable. During the Craig-era, improvements were made though, with Vesper Lynd (Eva Green) from Casino Royale being just one example. Vesper, it could be argued, turned Bond into the misogynist that he is after she broke his heart, but nonetheless, she actually had a substantial role in the plot of Casino Royale. And in Spectre it looked like improvements were continuing to be made with the casting of Monica Bellucci as Lucia Sciarra (the oldest Bond girl ever) and Dr. Swann (Léa Seydoux) initially rejecting Bond’s advances and seemingly being a strong female presence. That doesn’t last long as both become infatuated with James, Swann’s character almost comically so doing a complete 180 after the train sequence. I say all this with nothing but love for the franchise and for Spectre specifically. There are many areas where it does build upon Skyfall and even surpasses it in some respects. For being quite a lackluster henchman, Mr. Hinx (Dave Bautista) is central to one of the most stressful and high-octane sequences in recent memory. That train sequence does end on a laughable note, but minus that it’s heartbeat after heartbeat as Bond, Hinx, and Swann duke it out. Another memorable scene, and one of the best in the last couple films, is the torture scene at Oberhauser’s (Waltz) complex in the desert that had me cringing and squirming in my seat as a fine drill-bit bores into Bond’s skull. THE TAKEAWAY: The continued prominence of minor characters like M (Ralph Fiennes), Q (Ben Whishaw), and Tanner (Rory Kinnear) is a welcome sight and, as always the shout-outs and homages to past films was entertaining for a fan like myself. 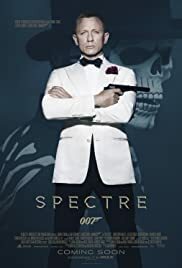 And while Spectre is no doubt a fantastic action movie, and certainly one of the most exhilarating Bond films in recent memory, some of the elements that have made Craig’s version of the Bond character stand out ahead of his predecessors are lacking in this film. It’s perhaps two steps back and one step forward in relation to Skyfall and the rest of the oeuvre. Very curious to see if Craig reprises his role for a fifth time and where the franchise will head next. I know I’ll be there to witness it.